Hamilton police have announced Friday the arrest of 31-year-old Peter Hopperton in connection with the vandalism on Locke Street last month. Hamilton police have announced Friday the arrest of local anarchist Peter Hopperton in connection with the vandalism on Locke Street last month. Hopperton, 31, was identified by police as "operator" of the local anarchist collective, The Tower. He has also previously been arrested in connection with a variety of political protest actions, including the 2010 G20 protests in Toronto. On March 3 at around 10 p.m. about 30 people dressed in black with their faces covered started setting off fireworks in the Kirkendall neighbourhood in the city's southwest, police said, and also damaged vehicles and threw rocks at store windows. Several businesses on Locke Street were targeted. Hopperton has been arrested for conspiracy to commit an indictable offence. He's expected to appear in court later today. 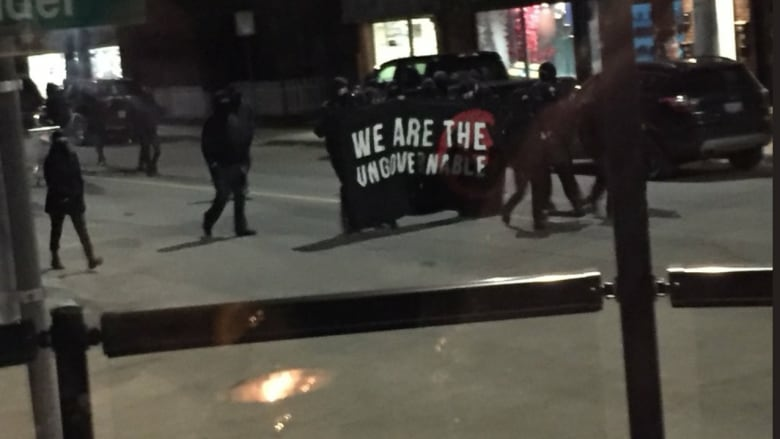 Police also said at a press conference Friday that they received further evidence linking the Anarchist Book Fair at Westdale Secondary to the vandalism on Locke Street. "There is a connection between the individual involved and (local anarchist group) The Tower," said Deputy Chief Dan Kinsella. "We believe that the individual, Mr Hopperton, is the operator." Kinsella said tips from the public and "electronic evidence" helped identify Hopperton. Kinsella said the arrest was made at a home in the area of Cannon Street and Hess Street. Hamilton police continue to investigate. Hopperton was also arrested during the G20 protests in 2010. He pleaded guilty to one count of counselling mischief. Hamilton police said on March 12 that they were "combing through hundreds of hours of security video and interviewing people" in order to identify suspects. Police say they are continuing to investigate. This the first arrest in connection to the vandalism. There were about 30 people involved, say police. "We continue to investigate any incident that is related or associated to anything that happened on March 3 or other related incidents and we will follow the evidence," said Kinsella.